Rodding Bonder RD50 is an epoxy based Bonder packaged in a 500ml dual component cartridge designed to embed fiberglass or steel reinforcement rods in countertops. Testing shows that the process can improve load tolerance up to 300% and deflection up to 1600%. 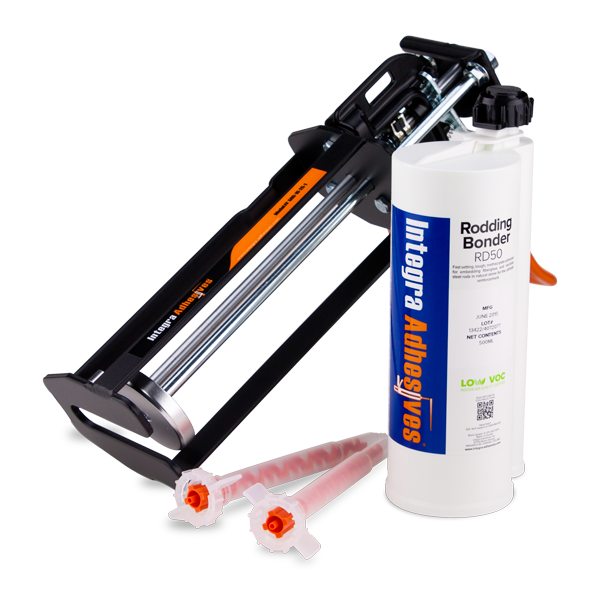 Rodding Bonder RD50 uses a measure-mix-dispense system (cartridge) that combines the strength of an epoxy with the cure speed and consistency of an acrylic. RD50 saves time (15-20 minute cure time), virtually eliminates waste and reduces overall costs. Rodding Bonder provides excellent bond strength for the various rod options available to fabricators; Steel and Fiberglass rods are both compatible.